Was Your Houston Windshield Replacement Correctly Installed? If you have recently invested in a Houston windshield replacement, you may be wondering how to tell if your new windshield has been properly installed. Working with a reputable company is your best guarantee of quality workmanship. If you do have concerns, checking out your new windshield can provide you with added information on its quality and durability. Here are some key signs to look for after your windshield replacement procedure. A properly installed windshield will not rattle or whistle while your vehicle is moving. If your windshield makes rattling noises, this could be a sign that it was not seated properly or that the adhesive was applied incorrectly. Whistling or loud wind noises are usually a sign that the windshield has not been sealed at all edges and will not provide waterproof protection for you, your passengers and your possessions. If you hear rattling or whistling noises after your windshield replacement in Houston, return to the installer as quickly as possible to point out the problem and to ensure that it is repaired to your satisfaction. 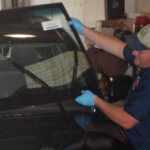 Windshields must be installed in a precise manner by technicians who wear gloves to ensure that no skin oils cause problems with adhesion of the adhesive and to allow for the clearest visibility. If your windshield is refracting light in an uneven manner, it can reduce your ability to see oncoming traffic and obstacles in your path. If your windshield appears wavy or uneven from behind the wheel or on the passenger side, it may have been installed incorrectly. 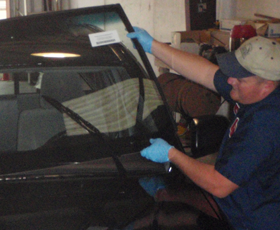 Bringing your vehicle back to the auto glass repair shop where the replacement was installed can help you ensure the greatest degree of safety and visibility for yourself and your passengers on Texas streets and highways. If your moldings are uneven or bumpy or if you can see adhesive around the edges of your windshield, your auto glass technician may not have removed all of the adhesive from your previous windshield before installing the new one. This can significantly reduce both the durability and the beauty of your vehicle and should be corrected as soon as possible. At Apple Glass, we specialize in providing top-quality auto glass in Houston. We offer mobile windshield repair services and maintain two brick-and-mortar auto glass shops to ensure the most convenient experience for you. Whether you need us to come to your location or you bring your vehicle in to us, you can count on the best and most durable windshield and auto glass repairs and replacements in the industry. Call us today at 713-680-1400 in Houston or 281-296-0600 in The Woodlands to get a free quote for your vehicle. We look forward to the chance to serve you. This entry was posted in Windshield Replacement And Repair and tagged Auto Glass Houston, Houston Windshield Replacement, Windshield Replacement in Houston. Bookmark the permalink.